As with all towns and villages around the country, Loddon and Chedgrave have had their share of accidents and disasters. This booklet mentions a few which have over the past century caused a bit of a stir at the time. 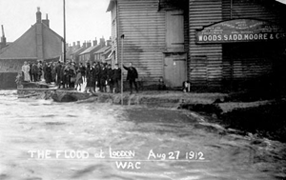 Although Loddon and Chedgrave must have been flooded many times through history, the worst, or at least the best documented occasions seen to have been in August 1912 and September 1968. At about midnight on August 27th 1912 a portion of the roadway was washed completely away and soon afterwards part of the bridge caved in. The footbridge across the river between the two Woods, Sadd, Moore & Co industrial sites disappeared downstream. The Mill was in great jeopardy and a gang of forty men worked hard to preserve as much of the road as possible. The piling and the banks of the Chet were washed away and some of the wherries broke their moorings. On 12th September 1968 a great storm followed a very wet summer, so when the heavy rain came that night, the ground was too waterlogged to let the rain drain away. The resulting flood can, no doubt, be remembered by many people. According to the Eastern Daily Press it had been Norfolk's wettest ever September day. The torrential rain was accompanied by thunder and lightning and many roads were inches deep in water. 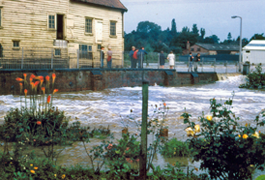 The photograph shows the river trying to revert towards the garage to its original course, some yards north of its present route. 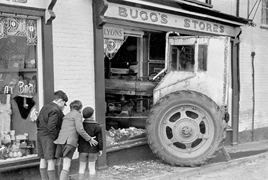 'Fison's kills pests, not Buggs' was the headline on Tuesday 17th December 1953 after a tractor, belonging to Fison's of Fakenham, ended up half in and half out of Bugg's shop window in Bridge Street, Loddon . Bugg's Stores was a prominent Loddon shop where just about everything could be bought. One of the grocery assistants was taking things from the shelf just behind the window when the accident happened. According to the newspaper, a tractor with an empty trailer behind was on its way up the street towards Beccles when it was in a collision with a lorry going the other way. The tractor mounted the pavement and went straight through the plate glass window. A similar accident had happened one year previously when one icy morning, a lorry coming down the street had skidded and gone through the other front window!